Lille Supreme Pants Maxi are highly absorbent incontinence pants specially designed for managing moderate to heavy incontinence. The pants are comfortable and discrete, and are designed to feel and appear just like normal underwear. As the pants are practical and provide the user with a sense of freedom, they are especially ideal for those who lead an active and independent lifestyle. Lille Supreme Pants Maxi feature a special wetness indicator, which informs you of when to change the pants. Advanced technology allows the indicator to turn blue when there is a large amount of saturation, indicating the need to change the pants. The pants are designed with a soft cotton material and have a breathable textile back sheet, ensuring maximum comfort and a pleasant feel during use. The soft elasticated sides in the pants allow for a very comfortable fit and provide effective protection against any leakages throughout the day. 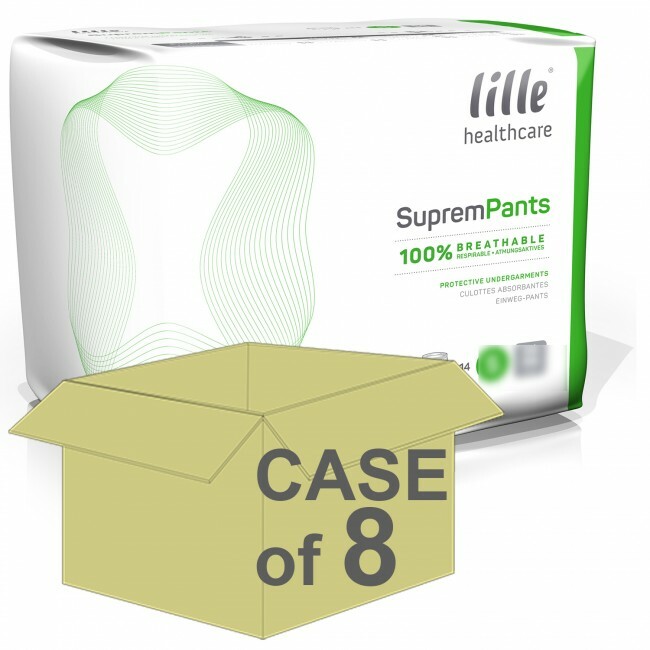 If you require an incontinence product which is comfortable, flexible and feels just like normal underwear, Lille Supreme Pants Maxi may be the ideal product for you. The pants are easy to fit and remove, promoting self-care and user dignity. You can simply pull the pants into place, with the addition of tear away sides designed to make them easier to remove.